Do you believe taste is important? If yes is your answer, then you are in agreement with 96% of consumers HZPC has surveyed. In fact these consumers indicate taste is extremely important and has more influence on their purchase decision than price. HZPC is a driving force in global potato business; we develop and market new types of potatoes. Innovator, a rather new RUSSET style potato variety is developing favour with consumers through out the world. Consumers appreciate Innovator’s excellent taste as a baked potato, as mashed potatoes, as roasted potatoes and certainly as French fried potatoes. 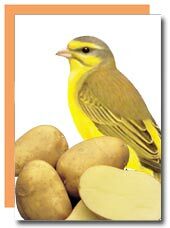 So what traits do Canaries and Innovator potatoes have in common? They are both yellow! For more information about this creamy yellow potato for your particular use, visit Producers, Packers, Retailers, Food Service or Consumers. © Copyright 2007, HZPC Americas Corporation. All rights reserved.